If you’re longing for some nostalgic 2D platforming gameplay, then you may be in luck. 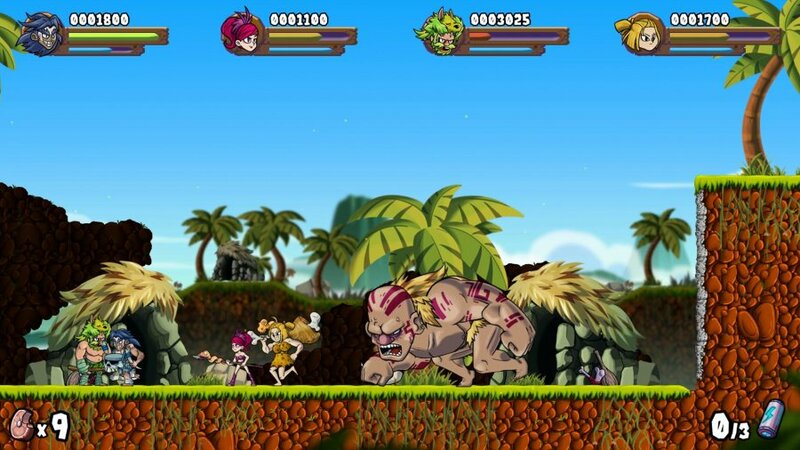 With the arrival of Caveman Warriors for the PS4, PC Steam, and Xbox One, players will get the ability to relive the Joe & Mac days. So it’s time to find your inner caveman and bring out the carnage! 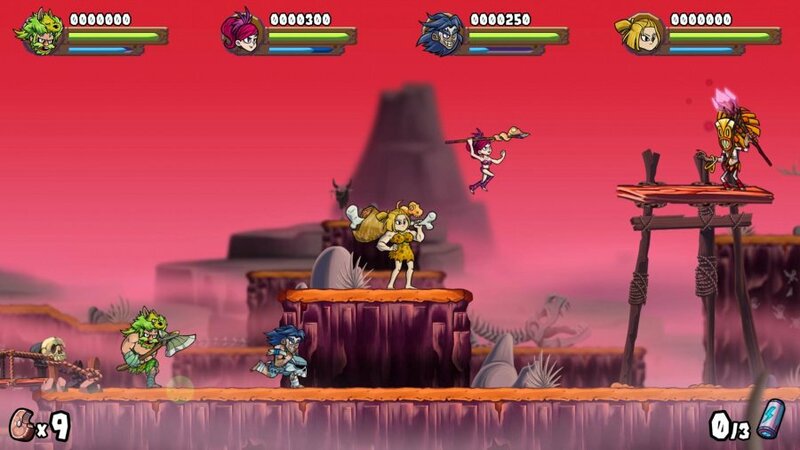 Caveman Warriors is a 2D platformer that allows you to play with three other friends within the “same couch”. You will be engaged in a journey to rescue your characters’ children from…aliens. So you get a mix of prehistoric setting with an incorporation of a science-fiction twist. It’s a weird concept but also a fun one. Every character has their own unique skills and abilities. First, there’s Jack who can charge and break through specific obstacles, Then you have Liliana who has spears that can serve as platforms. Moe uses his rammers made of bone that acts boomerangs that attack enemies. Finally, there’s Brienne who uses a stick with a piece of meat as a heavy club to hit her foes with an overwhelming force. If you’re playing on your own, you have the ability to switch between characters. The controls in Caveman Warriors is laid out quite well and are simple to learn quickly. If you’re familiar with 2D platforming, then this will be a walk in the park. However, I do highly recommend if you’re on the PC to use a controller. 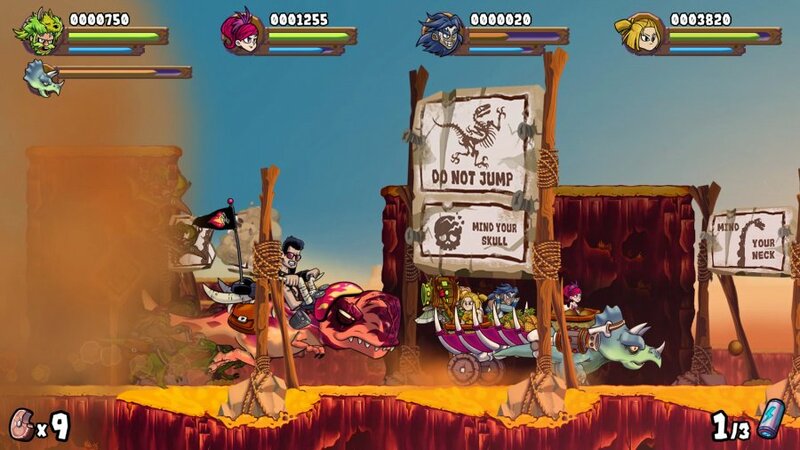 In Caveman Warriors, you have plenty of enemies that add variety to the challenge and gameplay. This is especially important and relevant when playing with a group of friends as you need some degree of difficulty in order to keep the overall sentiment lively. That said, the challenge, at times, can be at the point of overkill when there are just an excessive amount of enemies, which ultimately leads to frustration. Thankfully, you character has a health bar, so struggles associated with one-hit deaths is not the case here. In terms of the visuals, Caveman Warriors has a clean and colorful presentation. Nonetheless, the graphics lie a bit towards the simplicity side. This is acceptable if the game was meant to give a retro 8-bit or 16-bit look. But here, the charm seems to be lacking. The audio is dynamic with the music changing based on the environment. So overall, the presentation is at least above average. I would consider Caveman Warriors to be a decent platformer. The main issue lies with the fact that there are other games out there that offer 4-player co-op that offer the same or even more exciting content and presentation. That said, if you’re looking for a new co-op game to play with your friends, Caveman Warriors is worthy of a look.